Resurrection Sunday has come and gone. The tomb is still empty and Jesus still lives, but I wonder if it might be that some of our heightened awareness of Him may have come and gone with the date on the calendar. I pray that’s not the case – not for me and not for you. I’m praying that our worship is still filled with intense adoration and our praise for Him is fresh every day. And Sister, if we truly recognize the depth of our debt to Him, how can we live any other way? It’s easy to slide into the “take God for granted” lifestyle, but why would we want to? 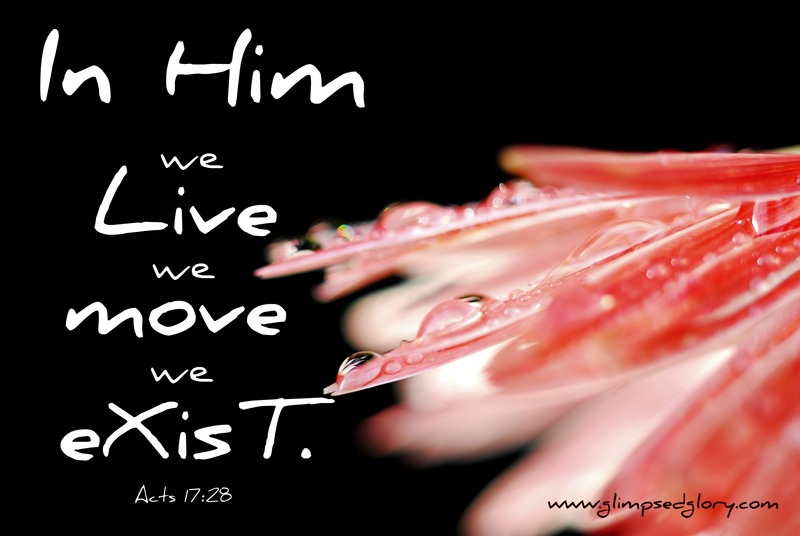 What keeps us from fighting to stay in a place of God conscious living? Oh the busyness of life drowns Him out too quickly. Hectic schedules vie for our attention and our time slips away. Responsibilities mount and the moments are gone. Chaotic careers turn our heads – especially if we work in a place where hurt and brokenness are all around us—and the fight slowly slips away. Life simply screams more loudly than that still Small Voice. 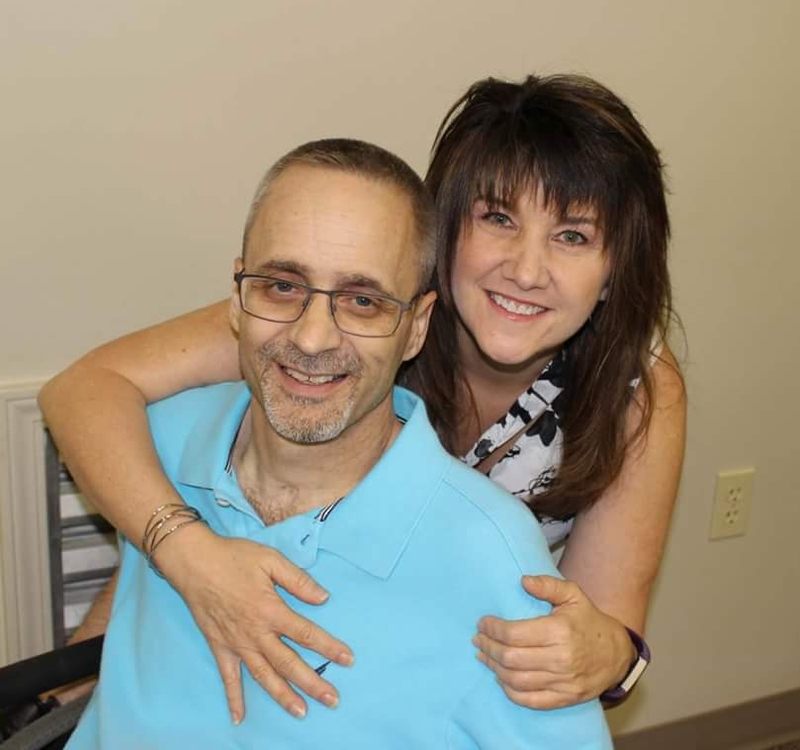 But when we fail to listen, when we choose not keep our heads turned toward Him – we are the ones who suffer and become empty—empty of Life and empty of Love. So what say for this year, you and I link arms and we live, move, and exist in Him just as purposefully and as intentionally after the Easter Season as we did during? What if this year we lingered longer, fought to fuel the fire and kindled afresh the flame at every turn? What if we lived with the same mindful, responsive love the woman who anointed the feet of Christ at Bethany did? Now one of the Pharisees asked Jesus to have dinner with him, so he went into the Pharisee’s house and took his place at the table. Then when a woman of that town, who was a sinner, learned that Jesus was dining at the Pharisee’s house, she brought an alabaster jar of perfumed oil. As she stood behind him at his feet, weeping, she began to wet his feet with her tears. She wiped them with her hair, kissed them, and anointed them with the perfumed oil. Then, turning toward the woman, he said to Simon, “Do you see this woman? I entered your house. You gave me no water for my feet, but she has wet my feet with her tears and wiped them with her hair. You gave me no kiss of greeting, but from the time I entered she has not stopped kissing my feet. You did not anoint my head with oil, but she has anointed my feet with perfumed oil. She knew the depth of her need for Him. She knew the condition she longed to be free of and the wounds her heart ached to be healed from. And she knew . . . that He knew. And yet, He did not simply choose to allow “the sinner” to touch Him, He welcomed her in His presence. Unheard of in that dispensation of time. Unfathomable that the righteous, the clean would be tainted by the unclean. But . 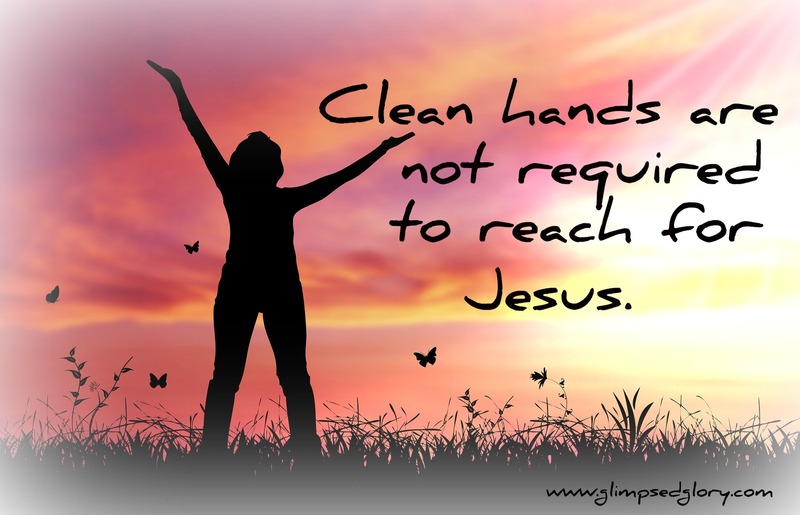 . .
our Jesus does not require clean hands to reach for Him. He welcomes the outstretched heart of the repentant who recognize their need and desperately grab hold. I would be so bold as to say that is impossible for those who believe they have clean hands to reach for the Savior. And I think if you’ll back at the passage, that’s exactly what Jesus is saying. When He tells Simon that the one who is forgiven little loves little, He isn’t saying that Simon has little to be forgiven for. Oh no Sweet One. He’s saying that Simon hasn’t realized the enormity of his own sin yet. Unacknowledged sin, excused sin, beats within an unrepentant heart. Simon shed no tears on the feet of Christ because he felt no godly sorrow. 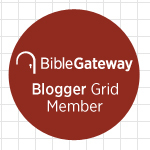 The woman’s sins may have looked different than the sin of self-righteousness and ritualism but both the actions of the woman and the actions of Simon required payment far beyond what either could pay. Only the priceless blood of Christ would ransom either of them. And Beloved, I think we need to be diligent in fighting the urge to look down on Simon the Pharisee because it might be that there have been times in life when we’ve looked at another and found our hands to be quite clean in comparison. It might be that we’ve had that same haughty heart toward someone who wore their sin on their sleeve a little more plainly. is a human perspective on sin – not a godly one. to love as He loved us. Sister, let’s be purposeful and intentional in our awareness of Him and what He has done. Let’s not let the changing season turn our gaze away from Him. Let us keep our eyes firmly fixed on the One whose heart is firmly fixed on us. Yes, Sweet Believer . . .
Let she who has been forgiven much love much. Let she who knows the touch of Jesus reach for unclean hands. And let she who is loved—love in His Name. 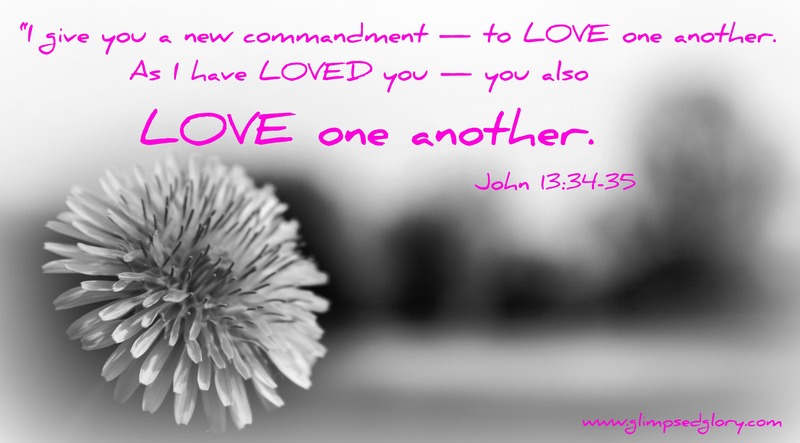 “I give you a new commandment—to love one another. ← Passion Week . . . The Resurrection! The love of God is unfathomable. I am glad for this revelation reaching out to His children, for it is the basis of our faith. Thank you, Marilyn and may the Lord bless you. Blessings to you as well Fellow Sojourner! May your faith increase by leaps and bounds as you seek to serve Him. Take Care Dear Friend. Thank you, Marilyn! Same to you. It’s always good to go with a Sister! Blessings to you Miss Jennifer!